Let us tell you about our fantastic services! 2 hours Deluxe Magic Party Package $385. Each additional 1/2 hour is $50. time, then the magician finishes the second hour with a magic show, which includes the appearance of a live rabbit at the end of the show. which includes the appearance of a live rabbit at the end of the show. 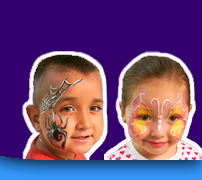 1 hour Face Painting and Balloon Twisting $225. Each additional 1/2 hour is $40 for each person. You get 1 face painter and 1 balloonist. Each face paint takes an average of 5 minutes, so in one hour we would be able to paint 12 - 15 kids. If you are expecting more than 15 kids at your party, you would need to book more time or we can do cheek art which is faster and takes about 2 minutes per child. We can face paint about 25 - 30 children in 1 hour. Elaborate balloons take 4 - 5 minutes per balloon sculpture and can accommodate 12-15 kids. Basic balloons take about 30 seconds to 1 minute per balloon and can accommodate up to 50 children with one balloon each. 1 hour Face Painting and Balloon Twisting $150. Each additional 1/2 hour is $50. You get 1 face painter/balloonist. Each face paint takes an average of 5 minutes, so in one hour we would be able to paint 12 - 15 kids. If you are expecting more than 15 kids at your party, you would need to book more time or we can do cheek art which is faster and takes about 2 minutes per child. We can face paint about 25 - 30 children in 1 hour. Elaborate balloons take 4 - 5 minutes per balloon sculpture and can accommodate 12-15 kids. Basic balloons take about 30 seconds to 1 minute per balloon and can accommodate up to 50 children with one balloon each. 1 hour Face Painting $125. Each additional 1/2 hour is $40. Each face paint takes an average of 5 minutes, so in one hour we would be able to paint 12 - 15 kids. If you are expecting more than 15 kids at your party, you would need to book more time or we can do cheek art which is faster and takes about 2 minutes per child. We can face paint about 25 - 30 children in 1 hour. 1 hour Balloon Twisting $125. Each additional 1/2 hour is $40. If your party is indoors you may choose to have elaborate balloons, which take 4 - 5 minutes per balloon and can accommodate 12-15 kids. Basic balloons take about 30 seconds to 1 minute per balloon and can accommodate up to 50 children with one balloon each.